Is Trump's Time Photograph Subversive Art? So it looks like the world is going to have to come to terms with the presidency of Donald Trump, of all people. What once seemed like a joke (in fact, the TV show The Simpsons made just such a joke over a decade ago) has become the reality, and while that raises all kinds of postmodern questions about the nature of life imitating art, it's also a grim political reality. Thanks in large part to his presidency, Trump recently graced the front cover of Time magazine as the Person of the Year. Before this becomes too outrageous, remember that 'Person of the Year' doesn't come with the word 'best' attached, it merely reflects influence - for example, Hitler was also a Man of the Year with a Time magazine cover, as were Stalin and Ayatollah Khomeini. Time's specific definition of the criterion for choosing their Person of the Year is simply "the person who had the greatest influence, for better or worse, on the events of the year.” Their feelings about Trump may very well be coded into the photograph. 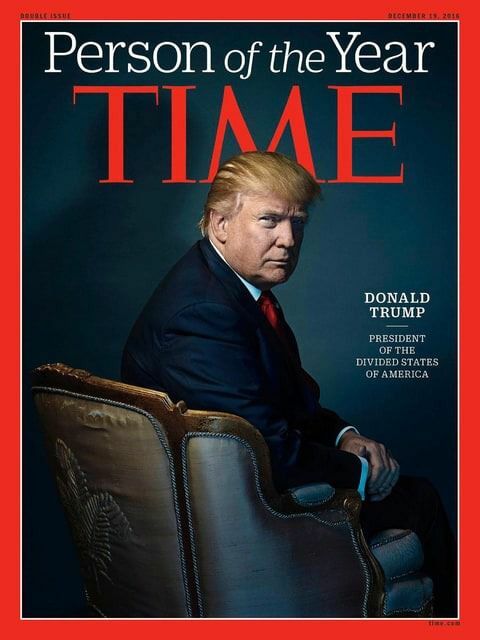 Strangely enough, the fact that the letter M in Time happens to place the two peaks just above Trump's head seems to have been only mentioned in passing, perhaps due to the crudity of the reference or its blatancy, but it does rather look like someone has drawn devil horns over his portrait. The rest of the analysis is far more indepth, however, even breaking the image down so completely that they read into the fact that there is a slight cracking of the upholstery in one place, which seems a rather ridiculous point to make. The primary features of the critique involve the colour reproduction, which mimics old Kodachrome film, calling up feelings of antiquity and a return to the past. There's also his odd pose, looking back over his shoulder into the camera with an air of disdain - it's not usually polite to sit with your back to someone. Finally, there's the chair itself, which is a classic Louis XV chair design - and for those of you who aren't history buffs, the reign of Louis XV was hardly a well-managed one. It's an interesting theory that probably comes a fair bit closer to fact. The photographer, Nadav Kander, has undoubtedly hidden some commentary in his cover piece, so be sure to read the full theory on Forward.